Your technology project may be big or small, but when you’re dealing with new tech and new requirements it can be overwhelming. These solutions are often highly customized and the scope can vary from a few new devices to thousands. Consider if your staff has the skills and expertise to install and manage the project. If you hire new people to help, will their skills be as essential when the project is up and running? It might be more practical to work with a program management partner. 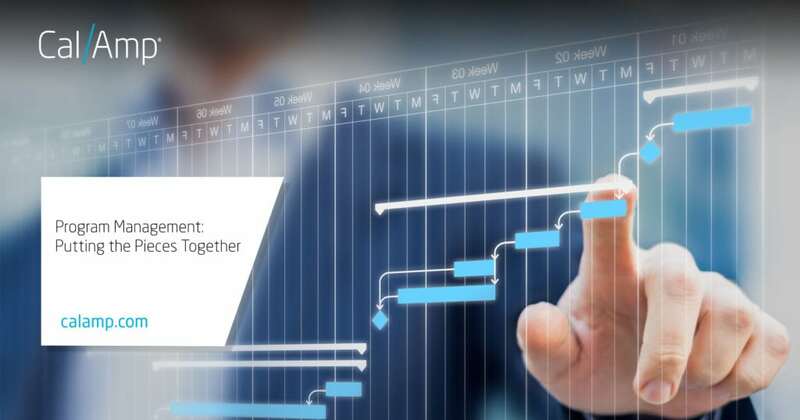 A professional services group that can design and implement your technology solution can also provide quality project management and staff to ensure your project is successful. Some clients find that their existing staff can successfully install new hardware, but they may need additional help with integrating the solution across different departments or business units. Consider a recent project for a large shipping company. CalAmp helped create a solution that would allow devices in shipping containers, tractor trailers, airport tugs and tractor rigs to all communicate to a cloud-based data repository to track inventory and processes. This solution involved not only many moving pieces but also many different departments that all had unique needs. It’s easy to imagine finding value in working with a contractor for a large-scale implementation. However, even support for smaller projects benefit from professional program management. Scalability is one valuable component of a flexible program. Some companies benefit from implementing a new technology solution with a smaller test group, which allows them to assess the compatibility of the solution at a lower cost. This flexibility can also help you manage costs with ongoing support. CalAmp offers three, tiered levels of support to our Professional Services clients that assist your team while still controlling costs. These plans start with online ticketing and device management. Some clients prefer to work with the same application engineer every time, which we provide in our second-tier service contracts. While other clients work with a CalAmp engineer assigned to the client site for the most comprehensive support. Tiered support staff is only one category of expertise that CalAmp staff offers. A professional services group works with your staff to deliver support where needed. That often means consulting with your installers or programmers to fine-tune a solution that works for your equipment and business environment. When your company doesn’t have staff with the skills and experience to create these solutions, CalAmp does. Using professional contractors to fill these roles means you don’t have to spend time recruiting new technical employees, which helps you bring your technical solution to market faster. CalAmp formally introduced our Professional Services group last year, but we’ve been providing design, installation and customization services to our clients all along. The team offers the flexibility to provide these services to clients with all types of technology solution projects. Your company can work with our staff experts to design and install the solution you need, with professional management along every step. If you would like more information on CalAmp’s Program Management and other services, please visit our page here or email us at PSInfo@calamp.com.